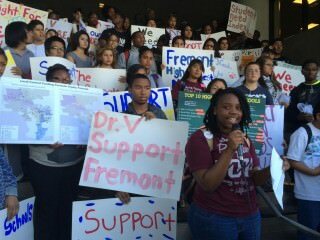 After weeks of trying, a group of students from Fremont High School finally got a meeting yesterday in the office of LA Unified Board President Richard Vladovic to promote their Special Need Index for use in the board budget negotiations. Vladovic wasn’t there, they were told, but they presented a petition with 4,300 signatures to Chris Torres, his chief of staff, calling on the board to consider additional metrics of need when deciding how to distribute money in the 2014-2015 fiscal budget. A major consideration in the board’s budget debate this year is deciding how to spend money to help English learners, children from low-income families and students in foster care. The new state formula requires districts provide added support to those groups as a condition of receiving added funding this year. Like all California school districts, LA Unified has a formula to determine where the money should go, but the Student Need Index uses added measures to assure a more comprehensive spending plan. The students, whose school is in Vladovic’s board district, had been trying for weeks to arrange a meeting with him, with many of their phone calls going unanswered.